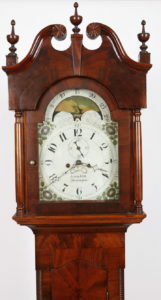 Joakim Hill (1783 – 1869), Flemington, NJ Mahogany Tall Case Clock. This example is Circa 1830 broken-arch scroll bonnet with book matched crotch mahogany panels on the scroll board. 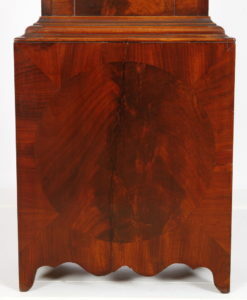 Three original turned wooden finials adorn the top of the case. The waist door with crotch grain mahogany inlaid oval panel and base panel with round inset panel both framed by cross banded figured mahogany trim all resting on original straight bracket feet. Note Sheraton Period turned columns that flank the case. 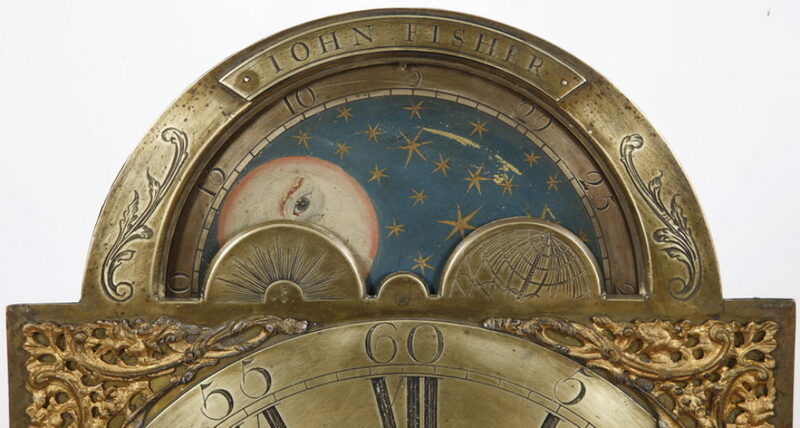 Eight Day striking brass clock works with seconds bit, calendar and moon phase dial. 95 1/2″h. 17 1/2 “w. 10 “d. Clocks by Joakim Hill are highly sought after and this one has wonderful overall proportions and outstanding figured mahogany wood selection. 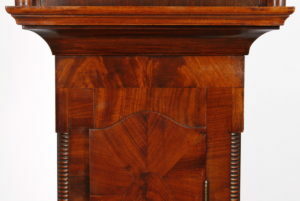 The early 19th century case has inset inlaid oval mahogany panels, a shaped waist door and original straight French feet. The backboard is one piece and is structurally sound. 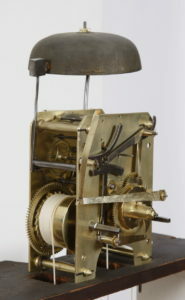 The eight day works are typical of what you find in Hill’s work with arched plates, smooth winding drums, and the “L” shaped lever arm that indexes the moon wheel. This movement is identical to several examples made by Joakim Hill that we have owned over the years. The works are complete including all of the motion work for the calendar and moon wheels. 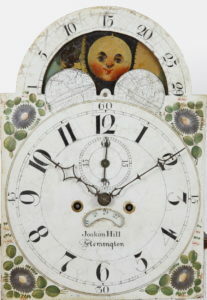 The locally painted iron dial is American and of Philadelphia origin which is characteristic of the early clocks made by Hill who rarely used English dials in his work. 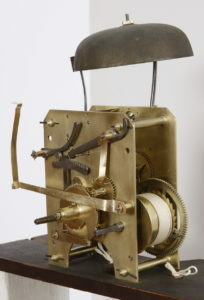 This is a clock that we have carefully gone through the movement and the clock runs and strikes perfectly.